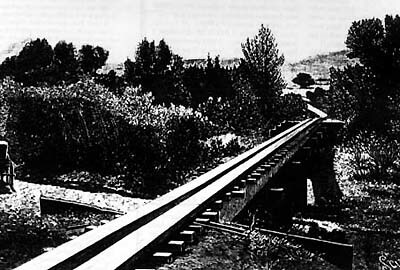 In the March 1958 issue of The Western Railroader, there is an article titled "Lime Kiln Railroad; the Tres Pinos Monorail." It seems that over one hundred years ago, a man named J.J. Burt built four lime kilns in Thompson Canyon. For five years, teams of horses pulled the production of these kilns to the railhead at Tres Pinos in San Benito County, California. 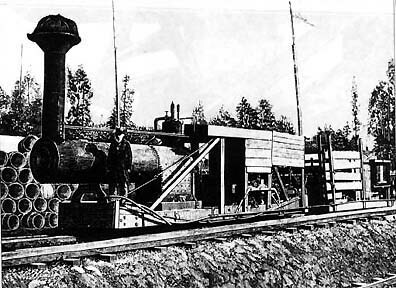 Thinking he could cut transportation time, he persuaded Jake Heff of San Francisco to finance a private railway to move the lime. In 1891, the first trainloads of the product were shipped to the Southern Pacific railhead and the conveyance was able to carry twice the load of a twelve horse team and wagon. The Railroad had offered Burt the steel rails and track supplies if he would just grade the right of way, but, seeing more profit potential in a privately run railway, he took on a project of his own design: He built a monorail (of sorts). The magazine describes his system as being constructed of "4x12 planks laid flat and parallel with a replaceable 4x4 inner lining at the edges and between these liners a space of about six inches. Instead of wheels the engine and cars ran on steel rollers, two to each, and just long enough to reach from outside to outside of the 38-inch plank roadway. 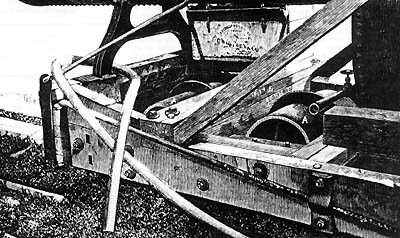 At the center of the rollers was a steel flange which occupied the six inch space and kept the rolling stock on the track. That flange was the undoing of the whole scheme. It chewed out the wooden track so consistently that repairs more than made up any profit." The entire affair was homemade with the engine being a steam unit from a tractor placed on a flat car. It was not very wide, owing to the need to make allowances for tight clearances. Since it burned soft coal, the engine never made much speed or power. The train was reversed by a turntable at each end of the twelve mile line. As the system was not overly reliable, the teams of horses and wagons were never done away with and operating both more than ate up all of the kilns' profits. "On September 5, 1892, the overheated engine with its water supply dangerously low, came to Pescadaro Creek. There on the bridge Engineer Bill Maynard stopped and dropped the suction hose into the stream and started to pump. It was a thoughtless act. The cold water coming into contact with the red hot flues and crown sheet produced an explosion that killed Maynard and scattered pieces of the equipment over adjacent scenery. The fireman escaped injury." This effectively ended the operation of the Lime Kiln Railroad; its backer, Jake Heff realized "that his money was irretrievably lost and shot himself and Burt went back to practicing law." The lime kilns eventually fell to ruin and the wooden track system was sawn up and sold as lumber or was salvaged by others to frame houses and barns. The purpose of the story is not to bring down our favorite method of transit, but to point out the discovery of a long-lost monorail system. It was an unfortunate ending for an always troubled system. The nice thing we can learn from it is that luckily, no monorails are still operated by steam power so this isn't likely to happen to any monorail trains again soon. Compare the safety record of monorail and any other form of transit (including walking to your destination) and which comes out as safer? That's right; monorail. Compare and save (lives).